Various Applications of the Term. Term used in the Talmud and Midrash for a Jewish heretic or sectarian. 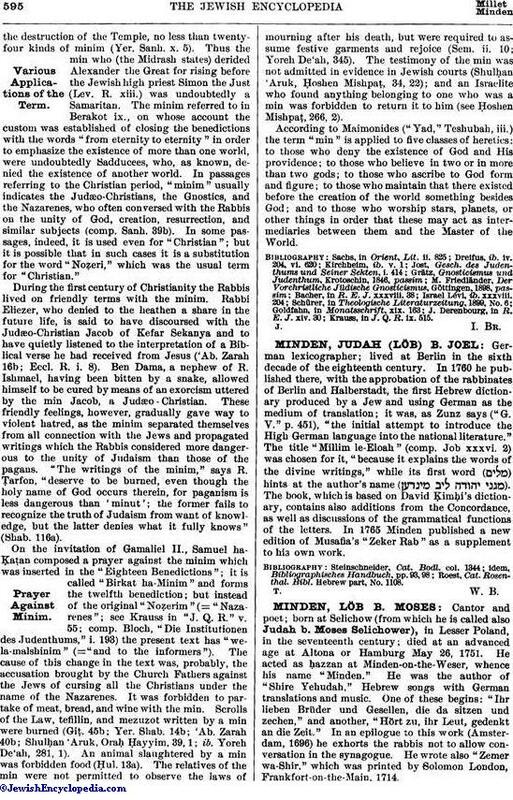 Its etymology is obscure, the most plausible among numerous explanations being that given by Bacher, namely, that it is derived from the Biblical (= "species"), which has received in post-Biblical Hebrew the signification of "sect"; and just as "goy," which in the Bible has only the meaning of "nation," took later the sense of "non-Jew," so "min" received also the signification of "sectary." As expressly stated by R. Naḥman (Ḥul. 13b), the term "min" is applied only to a Jewish sectary, not to a non-Jew. It is variously used in the Talmud and the Midrash for the Samaritan, the Sadducee, the Gnostic, the Judæo-Christian, and other sectaries, according to the epoch to which the passage belongs. Yerushalmi states that there were, at the time ofthe destruction of the Temple, no less than twenty-four kinds of minim (Yer. Sanh. x. 5). Thus the min who (the Midrash states) derided Alexander the Great for rising before the Jewish high priest Simon the Just (Lev. R. xiii.) was undoubtedly a Samaritan. The minim referred to in Berakot ix., on whose account the custom was established of closing the benedictions with the words "from eternity to eternity" in order to emphasize the existence of more than one world, were undoubtedly Sadducees, who, as known, denied the existence of another world. In passages referring to the Christian period, "minim" usually indicates the Judæo-Christians, the Gnostics, and the Nazarenes, who often conversed with the Rabbis on the unity of God, creation, resurrection, and similar subjects (comp. Sanh. 39b). In some passages, indeed, it is used even for "Christian"; but it is possible that in such cases it is a substitution for the word "Noẓeri," which was the usual term for "Christian." During the first century of Christianity the Rabbis lived on friendly terms with the minim. Rabbi Eliezer, who denied to the heathen a share in the future life, is said to have discoursed with the Judæo-Christian Jacob of Kefar Sekanya and to have quietly listened to the interpretation of a Biblical verse he had received from Jesus ('Ab. Zarah 16b; Eccl. R. i. 8). Ben Dama, a nephew of R. Ishmael, having been bitten by a snake, allowed himself to be cured by means of an exorcism uttered by the min Jacob, a Judæo-Christian. These friendly feelings, however, gradually gave way to violent hatred, as the minim separated themselves from all connection with the Jews and propagated writings which the Rabbis considered more dangerous to the unity of Judaism than those of the pagans. "The writings of the minim," says R. Ṭarfon, "deserve to be burned, even though the holy name of God occurs therein, for paganism is less dangerous than 'minut'; the former fails to recognize the truth of Judaism from want of knowledge, but the latter denies what it fully knows" (Shab. 116a). On the invitation of Gamaliel II., Samuel ha-Ḳaṭan composed a prayer against the minim which was inserted in the "Eighteen Benedictions"; it is called "Birkat ha-Minim" and forms the twelfth benediction; but instead of the original "Noẓerim" (= "Nazarenes"; see Krauss in "J. Q. R." v. 55; comp. Bloch, "Die Institutionen des Judenthums," i. 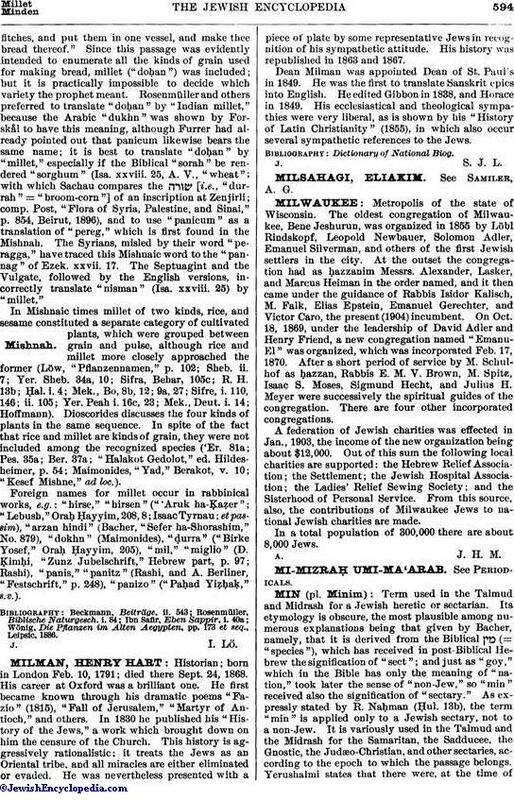 193) the present text has "wela-malshinim" (="and to the informers"). The cause of this change in the text was, probably, the accusation brought by the Church Fathers against the Jews of cursing all the Christians under the name of the Nazarenes. It was forbidden to partake of meat, bread, and wine with the min. Scrolls of the Law, tefillin, and mezuzot written by a min were burned (Giṭ. 45b; Yer. Shab. 14b; 'Ab. Zarah 40b; Shulḥan 'Aruk, Oraḥ Ḥayyim, 39, 1; ib. Yoreh De'ah, 281, 1). An animal slaughtered by a min was forbidden food (Ḥul. 13a). The relatives of the min were not permitted to observe the laws of mourning after his death, but were required to assume festive garments and rejoice (Sem. ii. 10; Yoreh De'ah, 345). The testimony of the min was not admitted in evidence in Jewish courts (Shulḥan 'Aruk, Ḥoshen Mishpaṭ, 34, 22); and an Israelite who found anything belonging to one who was a min was forbidden to return it to him (see Ḥoshen Mishpaṭ, 266, 2). According to Maimonides ("Yad," Teshubah, iii.) the term "min" is applied to five classes of heretics: to those who deny the existence of God and His providence; to those who believe in two or in more than two gods; to those who ascribe to God form and figure; to those who maintain that there existed before the creation of the world something besides God; and to those who worship stars, planets, or other things in order that these may act as intermediaries between them and the Master of the World. Krauss, in J. Q. R. ix. 515.